The business jets gather at Geneva. A successful trade show is defined by a) headline grabbing orders / b) new products. 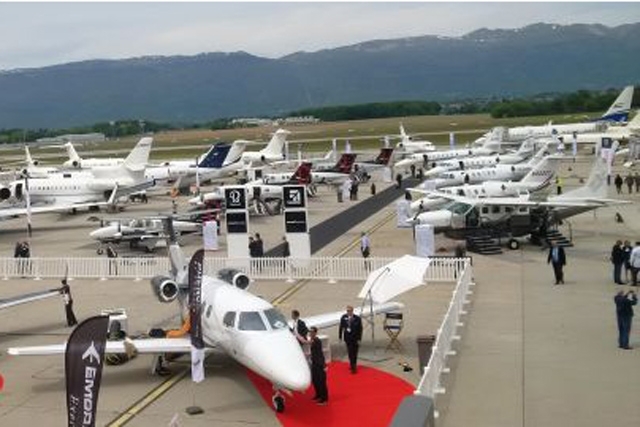 And on the latter, the 14th annual edition of EBACE, the industry's most popular business aviation gathering, did not disappoint. There were new brands too, showcasing - Airbus Helicopters, formerly Eurocopter and Textron Aviation - the proud new owner of Beechcraft, Cessna - and the Hawker name. Alison Chambers of Emerald Media reports. The darling of EBACE 2013, Switzerland's Pilatus Aircraft, which is marking its 75th anniversary this year, was back with more good news about its ramp-appealing PC-24 versatile light jet. Chairman Oscar Schwenk proudly announced the OEM had filled up the entire production line through to 2019, with a total of 84 orders logged. In a simple but effective marketing ploy, Pilatus posted up all the customer names and their delivery schedules for all to see. Schwenk also announced the aircraft would be formally presented in Stans (Switzerland) on 1 August - and we were all invited to see it. Showcasing this year with new products included Bombardier, who brought the biggest ever cabin exhibit Global 7000, its newest Global family member scheduled for customer deliveries in 2016. Hard on the heels of announcing the twin-engined 5X at NBAA in October last year, Dassault Falcon presented a second new family member, the Falcon 8X, a stretch of the trijet 7X. It features even more cabin room and with a range of 6,450nm, versus 7,300nm for the Global 7000. The Falcon 8X has been designed to carry eight passengers non-stop from Beijing to London and New York - at Mach .08, carrying a price tag of US$58m. Serge Dassault was on hand in EBACE to unveil it. Gulfstream followed suit with the announcement that it is to further improve the G650 - currently the world's longest range business jet with a 7,000nm range (the original G650 enters revenue service in Europe this week out of Geneva Airport, operated by ExecuJet and managed by Vertis Aviation). The new G650ER however will be able to fly at Mach 0.9 on trips of up to 7,500nm. Price tag = US$66.5m. Aerion too was back, with an even bigger stand and new model, explaining it has evolved its supersonic jet programme to make it larger - and now with three engines. The new trijet will have improved runway performance, but importantly it will conform to stringent ICAO Chapter 5 noise restrictions. The change came about because operators are asking for a bigger cabin, speed of course, and a range of 5,000nm or more. However, which manufacturer will build the Aerion is still unknown. Aerion's billionaire owner Robert Bass and other backers continue to fund the development. It may be nearly 10 years since we heard about the Aerion AS2 but it is still commanding interest in the fraternity and it was good to see Jeff Miller at the helm of PR again, after a spell supporting Gulfstream. EBACE is known for its networking and parties. Plus Champagne and canapés on the exhibitor stands. Enticements were on offer too to draw delegates in. London Oxford Airport, sharing a stand with resident charter company Hangar8 Plc and a dedicated coffee lounge, was offering free landings to new customers flying in with aircraft of MTOW four tonnes and over; while JetEx ran a draw for a top of the range Iphone. Stand out parties included the annual Altitudes bash at The Reserve; ExecuJet's gathering at Little Budda and Signature's party at President Wilson Hotel. NetJets marked its 50th anniversary out on the static by its new flagship, the Global 6000 with cake and champagne. The business aviation fraternity is comparatively young, but NetJets predecessor Executive Jet Aviation first launched the world's first private aviation charter business with 10 Learjets 50 years ago. One time NetJets executive, ebullient New Yorker and creator of NetJets' Marquis Card Kenny Dichter made his EBACE debut to talk up how his new members' only business aviation company Wheels Up is faring in the US. He gave a lively press briefing with Gama Aviation CEO Marwan Khalek, taking the opportunity to announce that Wheels Up is coming to Europe in summer 2015. "I want to have a Beech King Air 350i out on the static at EBACE next year," he said, applauding Gama Aviation for their sterling support backing them as operations partner in the USA. Gama will also support Wheels Up when it expands to Europe, Dichter said. To date Gama Charters Inc has accepted 17 King Air 350is and recruited 100 pilots for Wheels Up. The US operation is run similar to an airline with Gama Charters seeing that the aircraft are cleaned and fuelled ready to go first thing in the morning having flown in at 23:00 the previous night. "When we did our due diligence we needed a reliable operator of scale, that could ramp up with us." "We are happy to be an operator and also to play a support role to others - helping to deliver the promise. We as an industry need to broaden the customer base that comes to our church," added Marwan Khalek. The AfBAA (African Business Aviation Association)booth was buzzing throughout the show as it marked its second successful year. Supporting the growing demand for aviation finance, and in response to the associated challenges, AfBAA announced the development of a new fund valued at US$250m, which will be used solely for the purpose of financing aircraft within Africa. A new African company was also announced as Angolan company Best Fly signed an agreement with Iberia's maintenance division Corjet to create Best Fly Maintenance. The new partnership will see the Spanish company's business aviation maintenance capabilities mirrored at Best Fly's Luanda base, opening up a realm of opportunities in the West African region for training and maintenance support. A rebranded EAN Aviation (formerly Evergreen Apple) reported a successful year since EBACE 2013 with the creation of its own Nigerian Business Aviation Conference supporting growth in the region. The worst years of the global economic downturn are over, EBAA CEO Fabio Gamba acknowledged in his opening address. This year's guest speaker Roland Werner, Saxony Secretary of State for Economic Affairs, Labour and Transport urged the sector to keep his voice heard among the chorus of aviation interests when tackling European regulatory bodies. And European airports, he said, should preserve slots for business aircraft as the sector has a vital role to fulfil. Frank Brenner, Director General of Eurocontrol, made the point: "Business aviation movements are a good indicator of what the economy is doing. Whenever business aviation traffic figures go up it is a first, good indicator that our economy is gathering more speed." EBACE 2015 takes place once again at Geneva Airport 19 May - 21 May.